Global Energy Group, which is based in Inverness, wants to add more than 800 feet of new quayside to its Nigg Energy Park site. 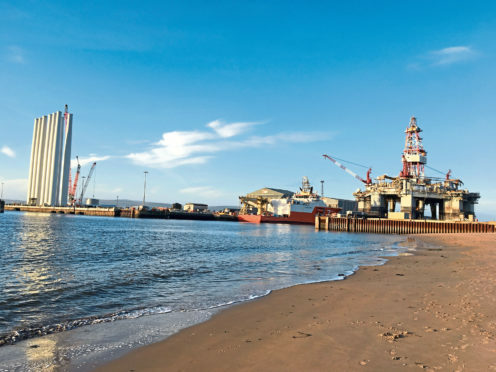 Inverness-based Global Energy Group (Geg) has announced multi-million-pound plans to add more than 800 feet of new quayside to its Nigg Energy Park site at the entrance to the Cromarty Firth. The company, headed by Highland entrepreneur Roy MacGregor, said it was confident the expansion on land to the east of the yard will create job opportunities and “bring further economic benefit to the area”. Geg’s announcement was last night welcomed by the Port of Cromarty Firth, which has responsibility for the firth’s shipping movements and recently started a £30 million project to extend its own quayside at Invergordon. Both ports were hit by the oil and gas downturn but have seen business pick up in that sector over the past year, while also benefiting from major projects for the offshore wind industry. The Nigg site is being used as a marshalling hub for the development of the Beatrice wind farm, eight miles off the Caithness coastline, and Geg said demand for quayside space there was now outstripping availability. The company, which has invested £50m in the site since acquiring it in 2011, declined to say how much the latest expansion was expected to cost. Rory Gunn, Geg facilities director at Nigg, said: “Since we took over the yard, we have continually listened to our clients’ requirements and sought opportunities to expand and grow. “We are the first port in Scotland to successfully conduct marshalling activities for an offshore wind project with the ongoing Beatrice development and during this period we have seen demands for quayside space which exceed our current infrastructure capabilities. Geg said “necessary studies and impact assessments” were now under way as part of the planning process for the expansion. Local public consultation meetings will be held at Nigg and Cromarty later this month to discuss the development.